Driveclub is one of the few current generation racing franchises that has pushed the boundaries on realistic graphics and driving mechanics. The developers at Evolution Studios have consistently given the game further updates and general improvements in terms of new vehicles to race in the latest Bikes update, but also in terms of minor graphical tweaks that may have gone unnoticed. Throughout all of this the game has performed at a peak horsepower, proving that it can go neck and neck down the stretch against other racing franchises and come out victorious. With another update releasing sometime next month, it has been revealed that Driveclub will now receive even more impressive developments. While speaking to fans on Twitter, Driveclub’s Game Director Paul Rustchynsky was asked a few questions regarding the future of the game. 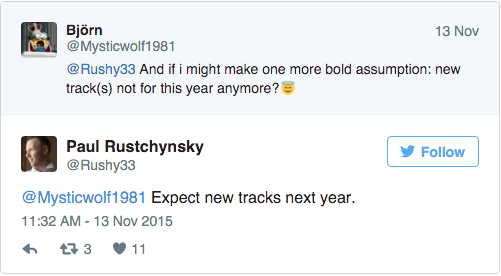 First off, he has confirmed that the game will be getting more tracks to compete on sometime next year. However, it was not mentioned when, or exactly what tracks in particular could be expected. 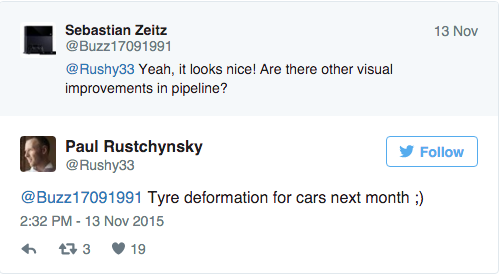 Apart from this, Driveclub will also be getting the aspect of tire deformation with next month’s update. A feature that will surely have major implications on the overall gameplay and maneuverability within the game. How exactly this will be implemented is yet to be known, but it just goes to show the completely pure and thorough experience that the developers have been striving to achieve with their racing franchise. On another note, Evolution Studios is also currently engaged in porting Driveclub to VR. Unfortunately though, no news has been released by the devs regarding this subject.